If your Mystique tent poles have been damaged or lost, this pole and stake set is exactly what you need. 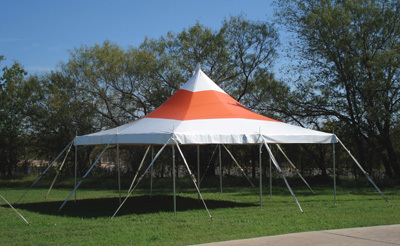 This set is specifically made as a replacement set for a Mystique 30-by-50-foot high peak tension tent. With galvanized steel poles and triple re-enforced stress points, you can be sure that these tent poles are durable. Each set comes with the necessary poles, 42-inch stakes, and a convenient storage bag. This replacement set is also covered by a one-year manufacturer's warranty. Choose the quality support system for your Mystique canopy with this pole and stake set from Ohenry Tents.